See below to get an impression of past events. For photos and a complete list of past events check our Facebook page. Sign up to our mailing list or facebook page to stay posted. Prepare to have fun at Festa LAfrique! 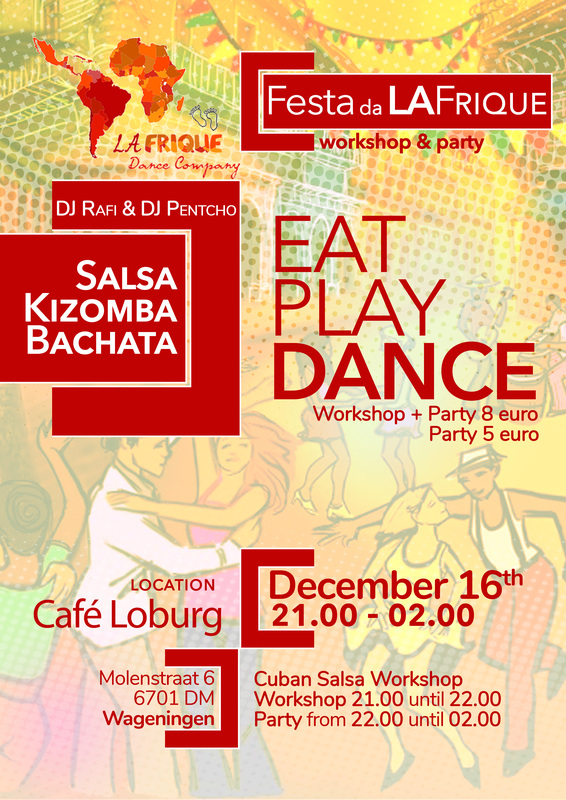 This time we bring you Salsa and Kizomba at Cafe Zwembad de Bongerd Wageningen. No worries, no bathing suit required! This is NOT a pool party! DJ Maximelody is one of our favorite DJ’s in the Netherlands. He’ll bring you the best of Salsa, Bachata and Kizomba. Come and join our free Salsa and Kizomba workshops on April 10th from 20:00 till 22:00 at the Orion building. In one hour each we will teach you the basics of Salsa Cubana and Kizomba. Fun guaranteed! Join us, bring your friends and discover your next addiction! Want to improve your Kizomba skills? Join us to the Tá Fixe Kizomba Festival in Porto, Portugal, on the first weekend of March. We have a SPECIAL DEAL for you. Just because you’re a part of the LAfrique family, you can get a discount on your ticket! Let us know if you want to use this opportunity. Send an e-mail to lafrique.dance@gmail.com and receive your discount code. Want more information? Check the official Tá Fixe website. Prepare to have fun at Festa LAfrique in the city centre of Wageningen. This time we bring you the best of two worlds. 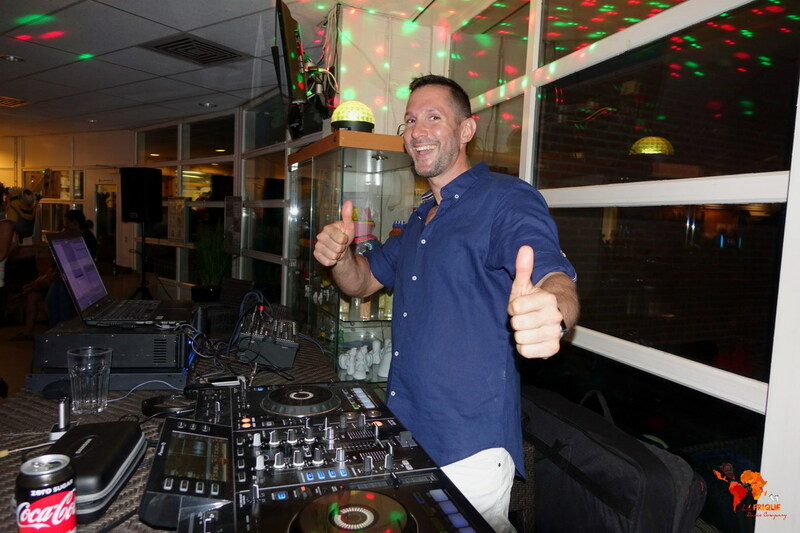 DJ Rafi is one of the best Salsa Cubana DJ’s In the Netherlands. Normally he spins a lot in the western part of Holland. This time you won’t have to drive so far. Make sure you don’t miss out on this experience! For the Kizombeiros your own house DJ will provide the beats. As Pentcho is a big fan of traditional Kizomba and Semba you will be dancing with a smile all night. You can find photos of this event on our Facebook page. This bootcamp is all about spicing up your Salsa Cubana. For starters, we’ll hand you the basic Reggaeton techniques, followed by Cuban Styling (boys & girls). To top it all off, we’ll put these new moves into practice on hot Cuban Salsa beats! Separate hours: 12 euro p.p. Entire bootcamp: 30 euro p.p. Are you ready for SOS LAfrique? This time we offer you the opportunity to let your friends experience the power of dancing. After the workshop we bring you one of the best Latin DJ’s in Holland to party with you all night! Dominican Bachata is best known for its energetic music and crazy footwork. In 1.5 hour we’ll teach you the basics of Dominican Bachata and add special footwork for more experienced dancers. * SPECIAL PRICE for LAfrique (ex-)students and their Friends. Join, Like Share and Invite your friends! 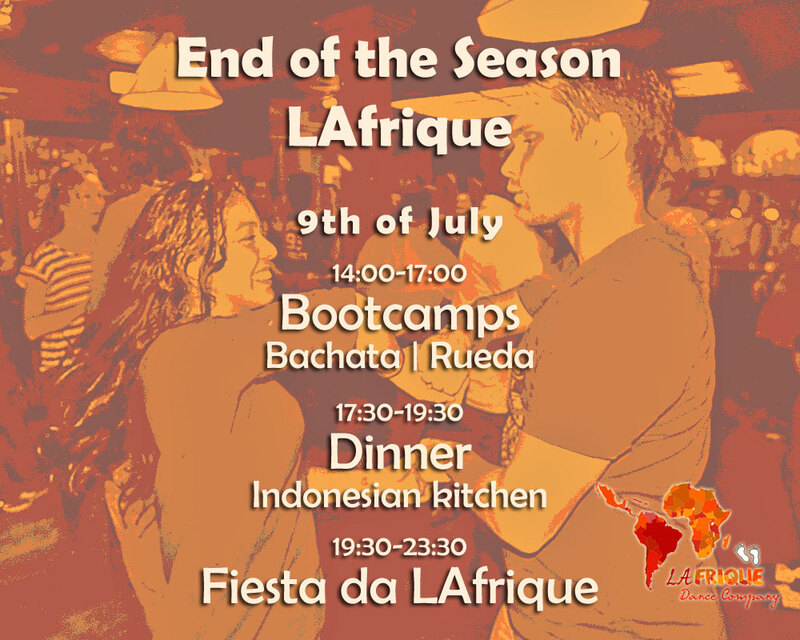 To end yet another great LAfrique dance season we are very proud to present our second LAfrique End of the Season Event! This is for all LAfrique enthusiasts including your friends and family. To participate you need to know the Basics of Salsa. No Bachata experience required for the first two hours. For the 3rd hour, improver dance experience is required. Registration for the boot camps and/or dinner is required. Click here to register. See you all at the 9th of July! We bring to you yet another great LAfrique Salsa and Kizomba Party! On the 23rd of February LAfrique will perform a Rueda de Casino workshop/demonstration at the Forum building. During lunch break, from 12:30 till 13:30, we will start off with a few nice and easy Ruedas. Then we’ll teach you something new. After that we will use the new patterns and show them to all present at the Forum building. All of this is to give an impression of a LAfrique Rueda lesson and promote the Wageningen Student Association Gala of March 17th. We invite you to join us if you have at least beginner level experience. Please let us know if you want to participate in this workshop/demo via our Facebook event. The previous bootcamp was a succes! Therefore we decided to organise yet another 3 hour Bachata bootcamp. A great way to have fun, learn how to dance Bachata and make new friends. In three hours we will take you through the history of Bachata. 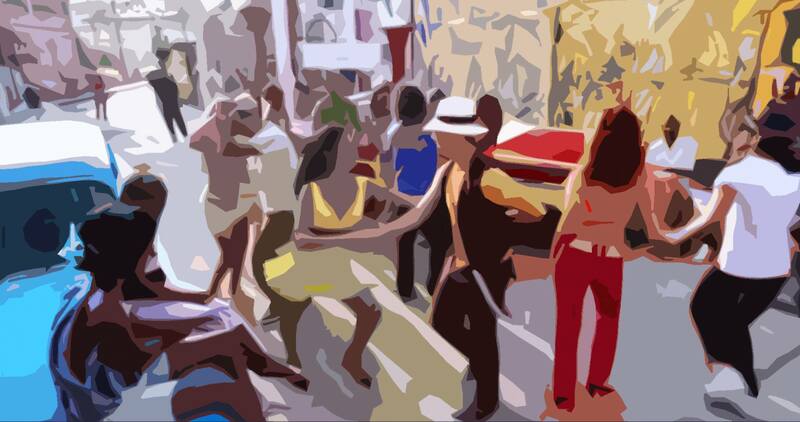 You will learn the basics of the three major styles: Bachata Romantica, Dominicana and Moderna. While working on each style we will teach a nice basic pattern. For more advanced dancers we will extend the patterns and give you exciting options. Daniel Scheerooren and Dieuwertje de Wagenaar, two great dancers and enthusiastic teachers of the LAfrique team. Sunday June 26 – 14.30hrs. -17.30hrs. 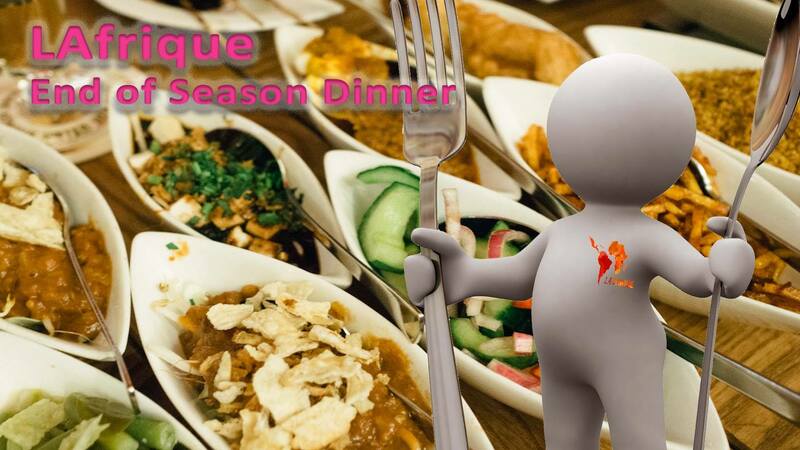 To end yet another great LAfrique dance season we are very proud to present to you our very first LAfrique Dinner! This dinner is open to everyone so invite your friends and family as well. Michel Boshuizen is a great chef with a passion for Indonesian and Surinam cuisine. He will make you crave for more with a fantastic menu. Between 17.30 and 19.00 you can mix and match any of the following dishes for €3,- each. – Saoto soup with rice, chicken and vegetables. Please let us know that you want to join us. Register here and make sure that there is food for you too. To end yet another great LAfrique dance season we are very proud to present to you our LAfrique End of Season Party! If you want to spice up your Salsa and be more playful in your dancing you cannot miss out on this one!! This workshop is for both LA and Cuban dancers. Basic knowledge of Salsa is all that is required.